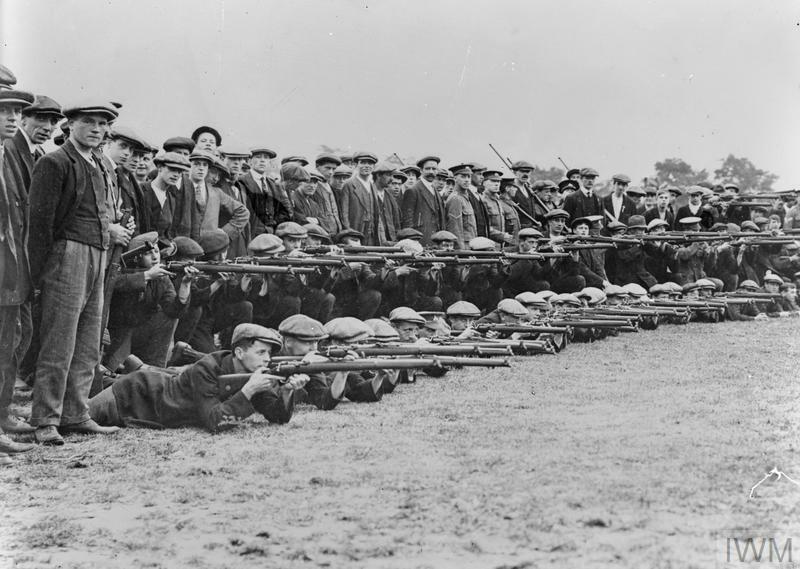 After the outbreak of war in August 1914, Britain recruited a huge volunteer citizens' army. 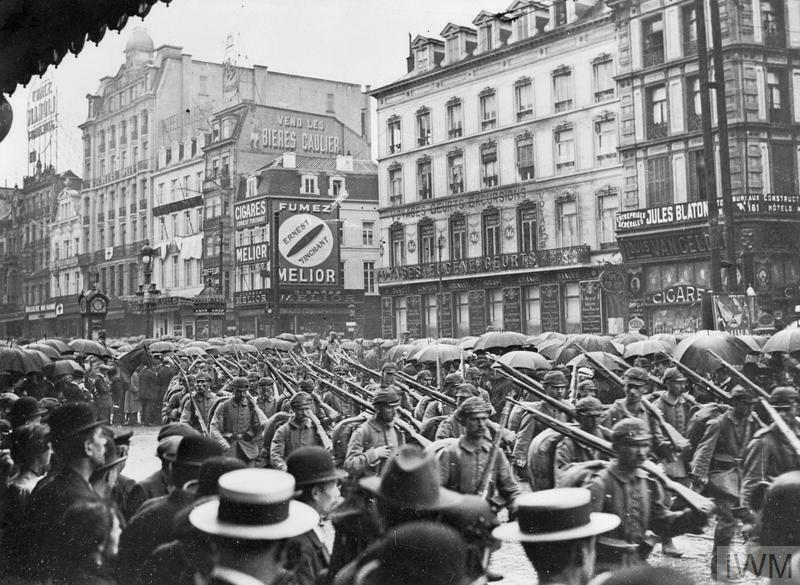 In just eight weeks, over three-quarters of a million men in Britain had joined up. Every volunteer had to undergo a series of medical and fitness tests before being accepted as a soldier. New recruits were then given months of basic training in camps all over the country where they learned to be soldiers. New officers learned to lead their men. The Army was unprepared for the stampede of volunteers wanting to fight, and men were often rushed through the official process for joining up. Conditions in training camps were often basic and supplies of equipment were limited. Here are some of the actions civilians had to take to become a First World War soldier in 1914. 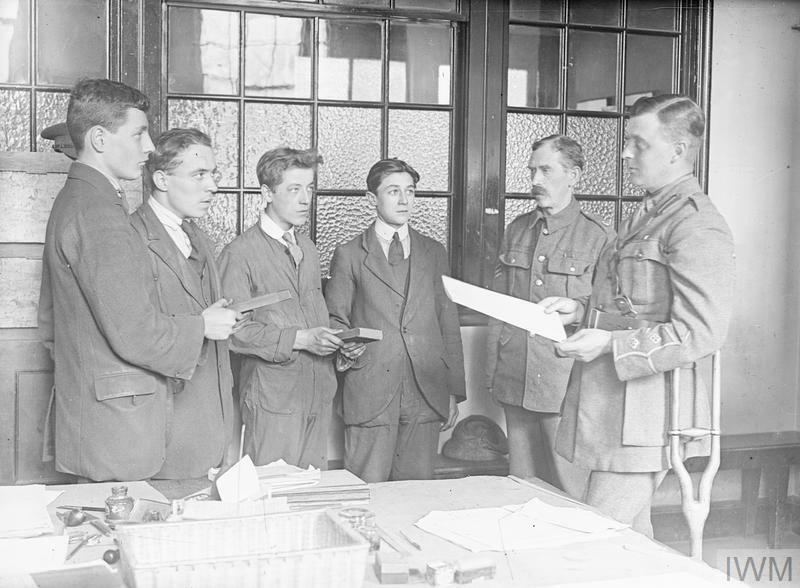 After the outbreak of the First World War, recruiting offices were besieged by volunteers. Public buildings were turned into new offices across the country. Administrative and medical staff were found to work in them and process the thousands of men eager to fight. 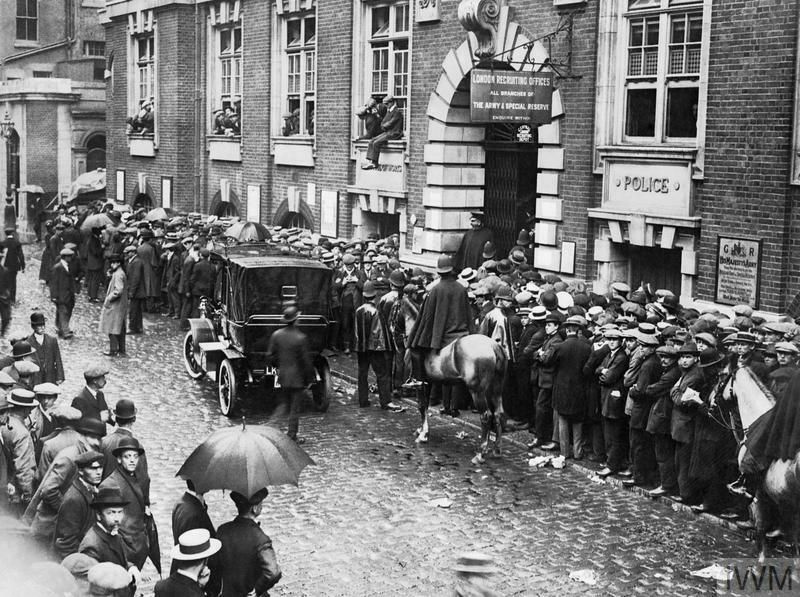 This photograph shows the queue outside the Central London Recruiting Depot at New Scotland Yard in August 1914. Some areas experienced such a rush that they sent men away with an appointment to come back another day. Although most men waited patiently for their turn, there were reports of queue jumping and mounted police being sent to control the crowds. The Army could not accept every volunteer. All new soldiers had to meet age restrictions, nationality criteria, and pass a medical examination. This was designed to reject those with health conditions and a physique deemed unfit for the rigours of a soldier's life and role. 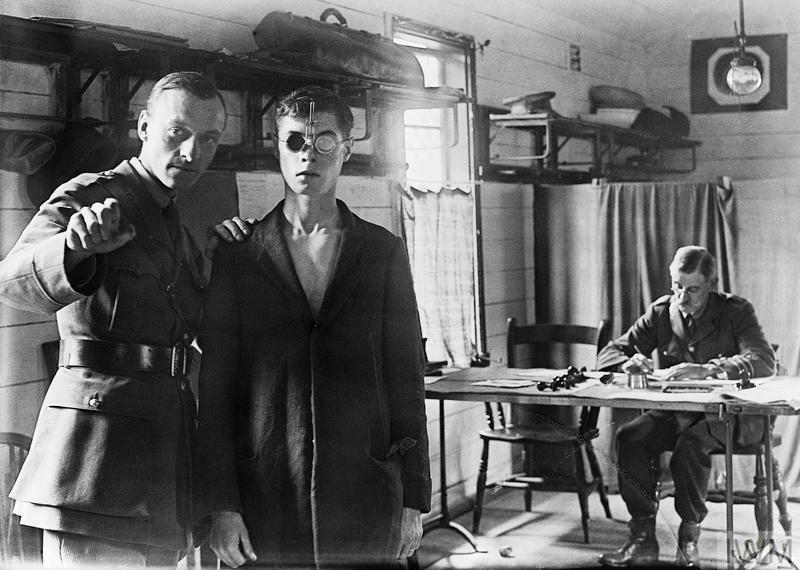 This photograph shows a man undergoing the Army eye test. Minimum physical standards fluctuated during the war. When the rush of recruits was at its peak, the height limit was raised from an original 5 feet 3 inches to 5 feet 6 inches to prevent an unmanageable flood of volunteers. It was subsequently lowered on a number of occasions in response to dwindling numbers of new recruits. But in the chaos of early 1914, a blind eye was often turned to official standards. Examinations could be brief and hasty, allowing many underage or unfit men to slip through into the Army. If successful in the various tests, new volunteers had to make a solemn promise to do their duty. In a ceremony led by recruiting officers, new soldiers swore an oath of allegiance to the King upon a Bible. But, with so many men eager to join up, the process was often rushed. Sometimes men were asked to recite the oath simultaneously in groups to speed the process up, as seen in this photograph. The oath required every new recruit to swear to 'faithfully defend His Majesty, His Heirs and successors…against all enemies'. It also required each man to promise to obey the authority of 'all Generals and Officers set over me'. Recruits pledged to serve as long as the war lasted. 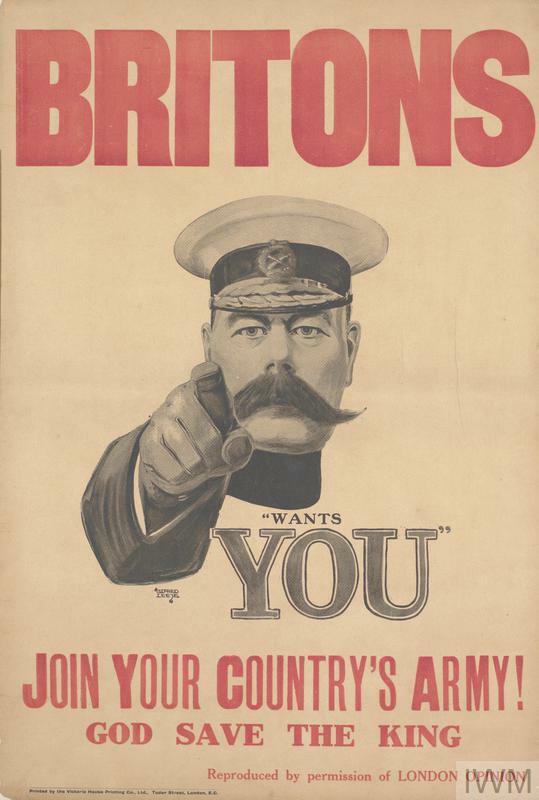 Lord Kitchener was Secretary of State for War and responsible for the recruitment campaign. His first appeal on 7 August 1914 was for 'an addition of 100,000 men' to the Army. 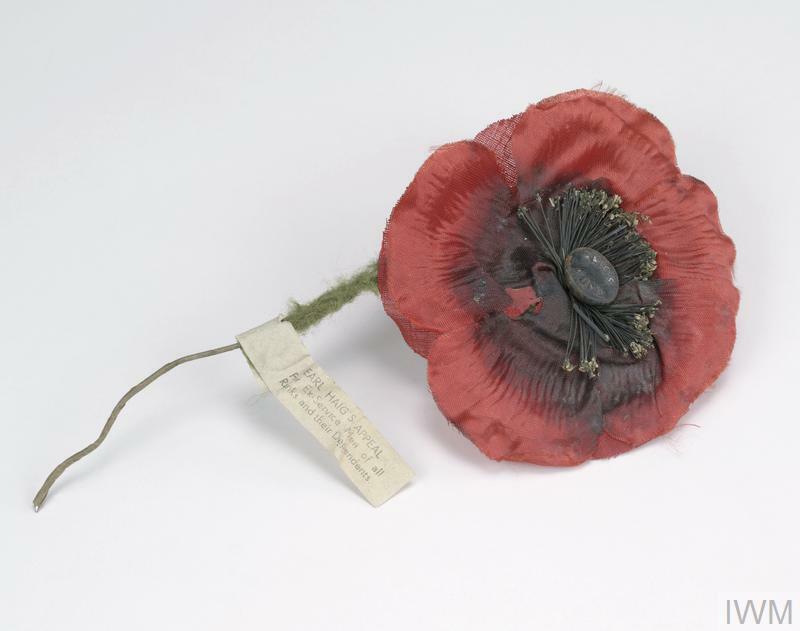 Within eight weeks nearly 750,000 men had enlisted. Some new soldiers took on specialist roles if they had a special skill like being able to drive. But most volunteers became infantrymen in new battalions, each numbering around a thousand men, which were attached to existing regiments. 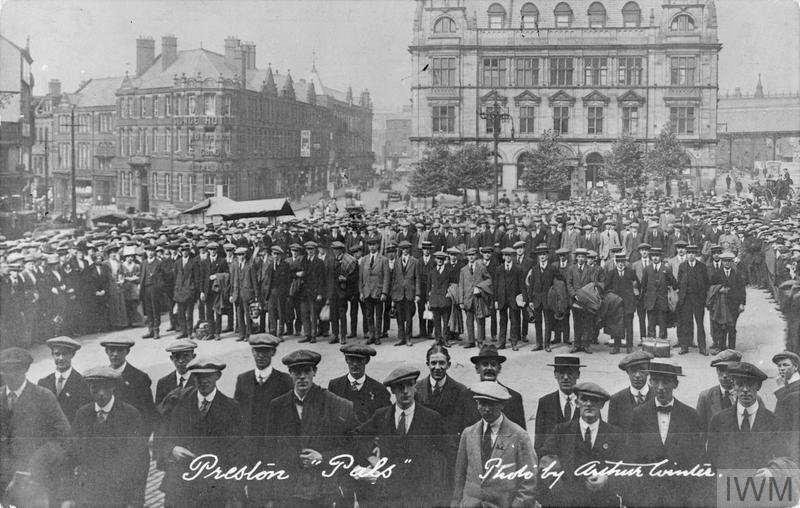 Many of the new units were 'Pals' battalions, like that seen in this photograph formed in Preston. These units allowed friends, workmates or those with some other common bond - like sporting success - to fight together. A recruit's transformation from civilian to soldier really began in one of the many training camps which were set up all over Britain. Over many tough months, the volunteers left their old lives far behind. They learned military discipline, drill and how to fight with rifle and bayonet. 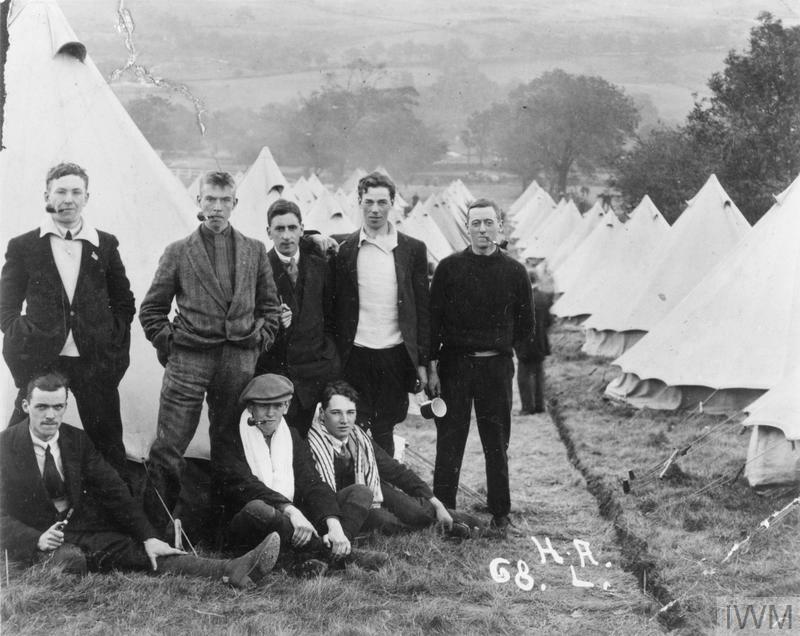 Many lived in tents, like the new soldiers of the 'Leeds Pals' seen in this photograph at a camp in the Yorkshire Dales. Their lives were now controlled by the Army. Men from every walk of life, from clerks and teachers to factory and shop workers, were crammed together. For many it was their first time away from home. The camps which sprung up across Britain bred tensions in some areas, with worries about drunkenness and relationships between soldiers and women. The Army struggled to supply new soldiers with everything on the uniform and equipment list. While officers were expected to buy their own uniform from a military outfitter, everything from boots and trousers to caps and vests had to be hurriedly produced and distributed for the other ranks. Thousands were issued with the temporary 'Kitchener Blue' uniform and a cardboard cap badge. Some recruits thought these substitute uniforms made them look like postmen. Others were made to wait many weeks before they received any uniform at all, and reports of clothing theft in camps were common. Learning how to use a rifle was a critical part of a new soldier's training, but weapons were in desperately short supply. This photograph shows men from the 'Grimsby Chums' at rifle drill wearing their civilian clothes. Many had to make do with a wooden 'rifle' until a real firearm arrived. In a country defined by class, only 'gentlemen' from the upper- and middle-classes were expected to become new officers in 1914. Britain's public schools and universities were the main recruiting grounds for the new leaders needed en masse to manage the hundreds of thousands of new soldiers in the ranks. Young officers were taught how to control and care for men and how to command their respect. The most junior infantry officers, second lieutenants, were often only teenagers. Each had to lead a platoon of around 30 men, many older and from much tougher backgrounds than themselves. 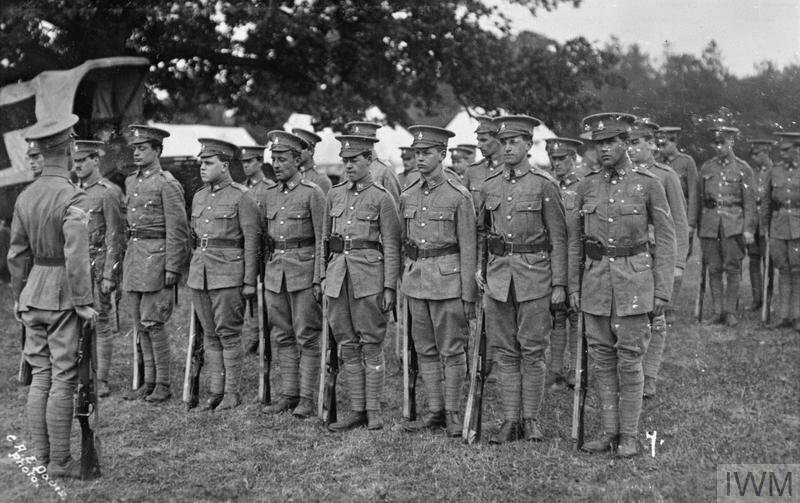 This photograph shows Cambridge University Officer Training Corps on parade in a Surrey camp. As casualties mounted during the war, new officers were increasingly drawn from the other ranks. The weeks and months spent as a trainee soldier improved the health of many men. 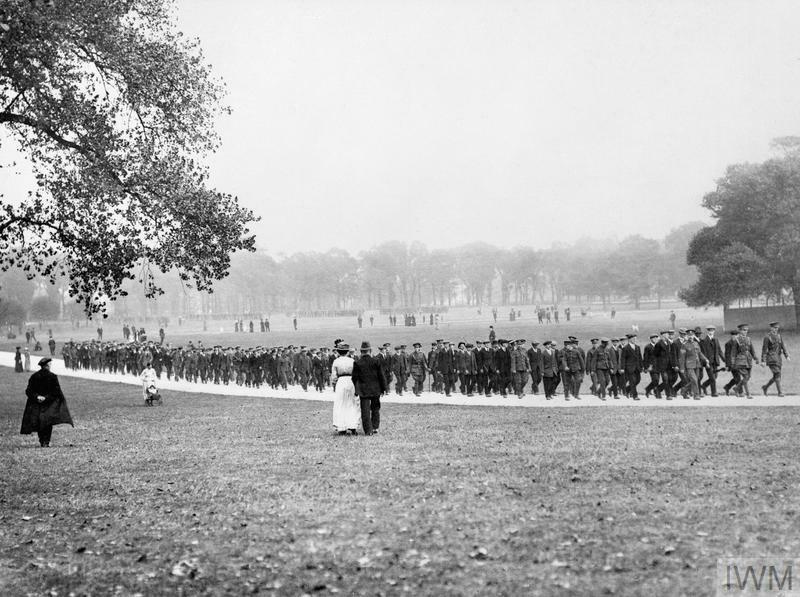 Some put on a lot of weight from Army food and arduous exercises, such as the route march through London's Regent's Park seen in this photograph. The time spent in training created a spirit of comradeship as soldiers became familiar with each other's habits and lives, and men learned to operate as a cohesive unit. Soldiers departing for the fighting front from Britain's coastal ports were often waved off by patriotic civilians. For most, it would be their first time abroad. Each soldier carried a message from Lord Kitchener in his pay book, reminding him to be 'courteous, considerate and kind' to local people and allied soldiers, and to avoid 'the temptations both in wine and women'.